How's everybody? Cacai M.'s Place Friday Fill-Ins is here again. I hope you are in the best of everything in there. If not, I would be sad. :-( Weekend is here so we have to be energetic to enjoy ourselves either in our own abode or in any places we like to celebrate the weekends. Have fun! And..
1. Life is great! Let us enjoy it. 2. Disneyland is one of the best places to people watch EVER because there are many beautiful areas to enjoy with, colorful themes and people are just smiling anywhere. 3. if I was going somewhere, the one thing I have to bring is camera. 4. I am going to deliver her soon enough. 5. Next year, is a better year. 6. She was lost and I found her at the back of the building being lonesome, how sad. 7. And as for the weekend, tonight I'm looking forward to finish what I have to finish_____, tomorrow my plans include maybe wash clothes but mainly sleep and do computer stuffs and Sunday, I want to just laze around (hopefully I can go to church, help me God. )! Just feel the fun whatever place you are now. 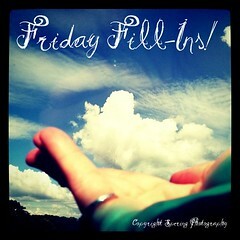 Happy FFI and happy weekend everyone!